LETTER | Which mode of public transport should be implemented in Penang? The state government’s Penang Transport Master Plan (PTMP) proposes an elevated Light Rail Transit (LRT) serving as the public transport backbone on the island, in the first phase of the massive project. 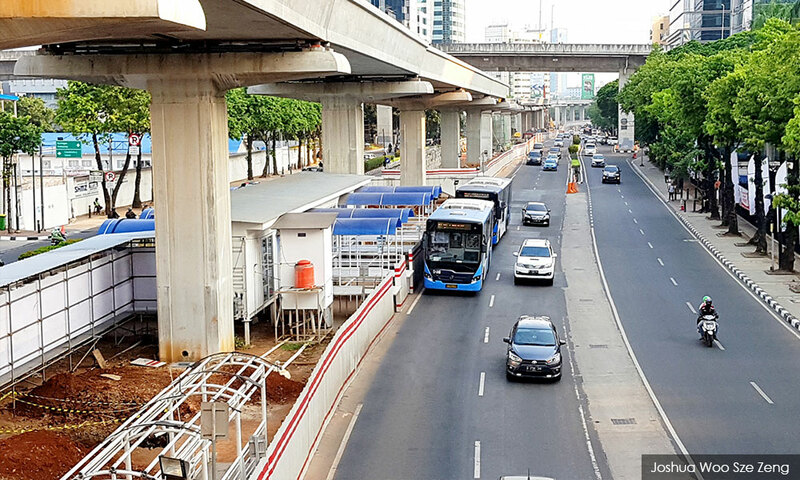 Since the announcement of the LRT plan three years ago, there have been counter-proposals with alternatives such as Bus Rapid Transit system (BRT) believed to be cheaper and quicker in implementation. However, many do not know what the BRT is and how it is different from regular bus services like the present Rapid Penang buses. The only example in Malaysia is the RM634 million Sunway BRT with its own 5.4 km elevated road, launched in June 2015. There are two distinct features of the BRT that are absent in regular bus services. First is the dedicated lane and given priority at road intersections for buses to move with the least interruption from other vehicles. Some BRT systems come with two dedicated lanes in one direction to optimise the movement of the bus fleet. Second is the fare-payment system that requires passengers to pay the fare before entering the station to wait for the bus in order to facilitate faster boarding. Although the Sunway BRT has these two features, the system’s dedicated lane is actually an elevated road, not a lane carved out from existing roads. Having an elevated bus lane on Penang island is not a serious counter-proposal to LRT as the LRT can carry more passengers with more comfort than a bus. Not to mention that one of the objections against the elevated LRT is that the elevated structure will diminish the scenery of the island. So it makes no difference with an elevated bus lane. Therefore, an actual bus-based alternative to an elevated LRT would be a BRT system with dedicated lane carved out from existing roads. Alas, we have no such system in Malaysia. So we would not know its actual pros and cons. 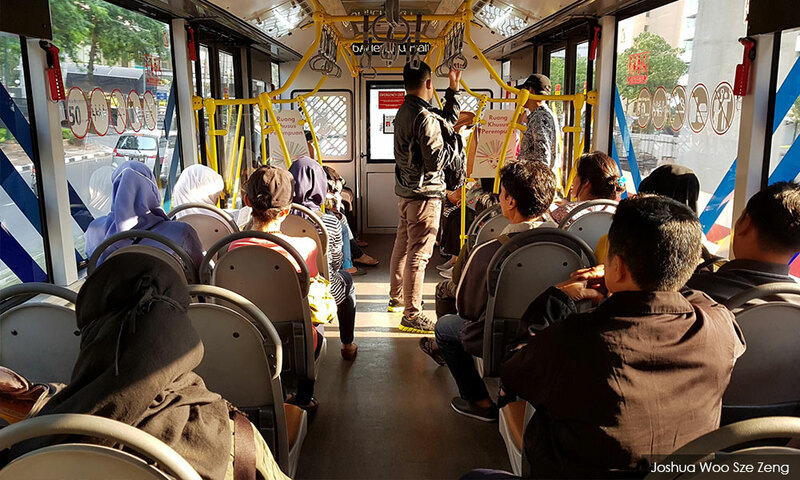 In order to have first-hand knowledge about BRT, I went to Jakarta to see and experience for myself the TransJakarta, one of the longest BRT systems in the world. TransJakarta was launched in February 2004 as the first BRT in Southeast Asia based on the TransMilenio BRT in Bogota, Columbia. Over the years TransJakarta has grown to now having 128 routes with 13,000 buses and ferrying over 524,000 passengers each day. Even with a dedicated lane, BRT buses cannot avoid sharing roads with other vehicles and pedestrians. There are intersections and narrow roads where dedicated bus lanes cannot be designated. At crowded places such as Kota Tua, even the BRT with dedicated lane cannot reduce traffic gridlock and likewise is stranded in the congestion at junctions, prolonging commuting time. Dedicated lanes are not feasibly implemented at busy roads. The lanes are mostly found along and near bus stations. TransJakarta’s bus stations, called “halte,” operates like an LRT station. Each halte is equipped with a screen to show the estimated arrival time of the buses. The service requires passengers to pay the fare after stepping into the bus. Large crowds during rush hour will create long queues, delaying the boarding process. By requiring passengers to pay for the fare before getting onto the boarding platform, the BRT eliminates the need for long queues, allowing immediate boarding when the bus arrives. Commuting duration is shortened not at the time the passengers step into the bus, but at the time when they enter the halte. Like the LRT. The halte is a raised platform, 110 cm from the ground. This is to avoid having stairs on the bus which again is to reduce boarding and alighting times. This platform design comes with its own weakness. Unlike the LRT, the gap between the BRT bus and the platform is wide, a risk to passengers who can fall in between the bus and the raised platform. The LRT’s gap is much narrower and poses a lesser risk for passengers. 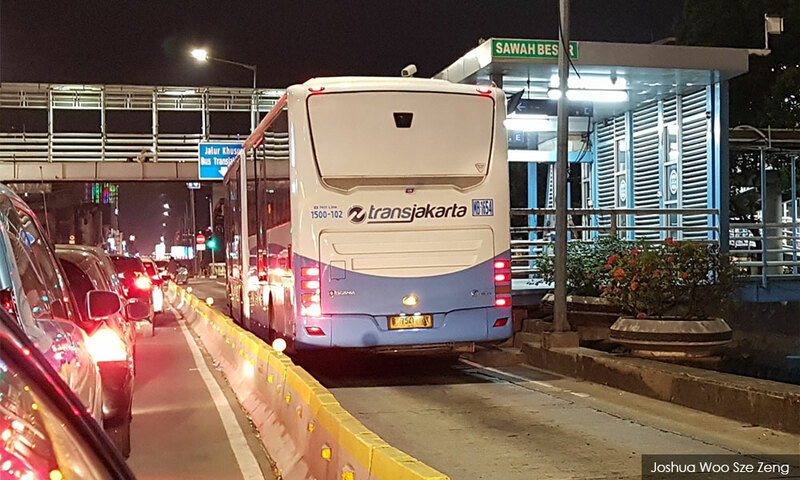 To overcome this, each TransJakarta bus comes with a service officer to assist with the boarding and alighting process. At each stop, the officer will stand between the bus and the platform to remind passengers to mind the gap. After the platform is cleared, the officer informs the driver to move, avoiding disastrous situations where the bus accelerates while passengers are still crossing the gap. Like Rapid Penang buses, the TransJakarta’s interior is compact and clean, with spacious standing room and plastic chairs. However, like the Sunway BRT and regular buses, the TransJakarta jolts a lot, causing discomfort to passengers’ shoulders and necks after a while. The inertia from the bus’s movement on the road often thrusts standing passengers in all directions. It can be an unpleasant ride for passengers with motion sickness. The BRT is meant for short trips. It is not comfortable for trips that are more than 30 minutes. When the buses are caught in a traffic jam the passengers are as helpless as car drivers. Motorcycles are the best option in such places. That is the reason why bike-hailing services such as GrabBike and Go-Jek are very popular in Jakarta. Learning from my first-hand experience on one of the world’s largest BRT systems, Penang needs to first expand its road network by building more roads in order to install the BRT. The present narrow roads on the island do not seem to be able to cater for an optimised BRT system with two dedicated lanes per direction. Jakarta has large roads with six to eight lanes in two directions. They can, therefore, implement the BRT. However, the buses are still caught in congestion in crowded areas like Kota Tua even with dedicated lanes. To build more roads for the BRT and also the special bus stations will necessarily require more land which will tremendously add to construction costs. The BRT may be more suitable on the Penang mainland with vast land for wide roads. Given the unique conditions of Penang island, an elevated LRT is more feasible. Not only does the LRT not need new roads for dedicated bus lanes next to existing roads, the elevated track saves the train from being delayed at intersections and pedestrian walkways, not to mention that the LRT provides a more comfortable commuting experience for passengers. That is the reason why Jakarta is currently building its own elevated LRT as well as an underground Mass Rapid Transit system. The BRT has been around since 2004 and they have come to terms with its limitations. Penang can learn from Jakarta’s experience.